West Michigan has a unique opportunity to capitalize on a one-of-a-kind natural resource to transform the Region into a destination for families and outdoor enthusiasts to not just visit but to live, work, and play. It should be noted that the conditions needed to create and restore rapids on par with this project are extremely rare in an urban setting. 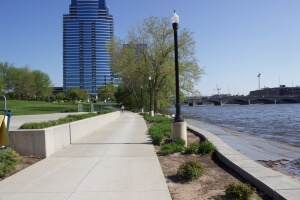 The natural elevation change of the Grand River through the project area is only found in a handful of cities in the world. A treasure lies underfoot.